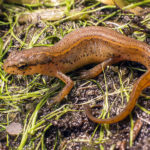 Newts are amphibians with lizard-like bodies. 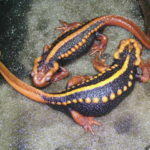 They are known as eft when they are juveniles. Semi-aquatic in nature, they spend their time alternating between land and water. 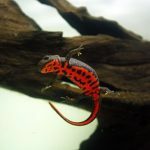 More than a hundred species of newts are found in North America, North Africa, Europe, and Asia. 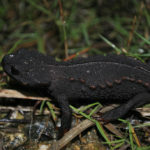 The breeding season for newts occurs in June and July. The male passes on a spermatophore on to the female. 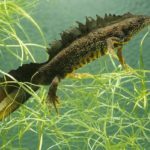 Eggs are then laid and are usually attached to aquatic vegetation. 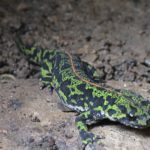 Tadpoles soon hatch and feed on small invertebrates, algae, and other tadpoles. 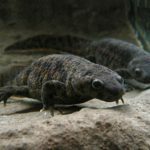 After this, they go through metamorphosis and the tadpoles lose their gills, replaced by lungs, also developing limbs. 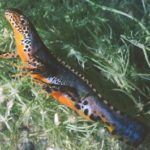 Newts can keep on regenerating many of their body parts over and over again throughout their lives. 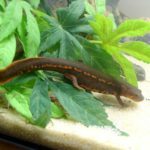 Adults feed on fish, shrimp, water insects, small crustaceans, and other smaller newts. 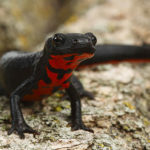 Some newts can produce toxins from their skin as a defense mechanism against potential threats. 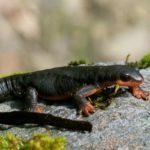 The rough-skinned newt can generate enough toxins to kill an adult human.